Drama. 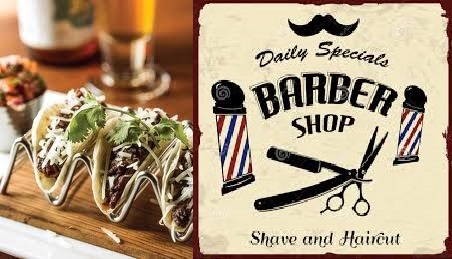 After patiently bidding up the fast food companies by $50 billion and +24% all last year, and collecting $5.5 billion in dividends, the market decided that it was time for … a haircut? And promptly trimmed $11 billion and 5% off the aggregate market value with presumably discretionary cuts on assorted others – some of whom were “scalped”. Please see Exhibit 1 below. The way the market works, of course, is that somebody bought at the top what somebody else was selling, and those who did are probably now wondering if they did the right thing or should they have bought their own lunch instead of everybody else’s? And despite 100,000 books and memoirs to the contrary, nobody knows how the market really works or what it’s working on now (CNBC, February 4, 2014, ‘Hot money’ ride could be getting put on ice). But America doesn’t travel on an empty stomach – and it’s travelling now – and we like food and we like these stocks and, as usual, we buy them all – if warranted and with the usual safeguards – because if we’re not eating at one, we will be eating at the other. 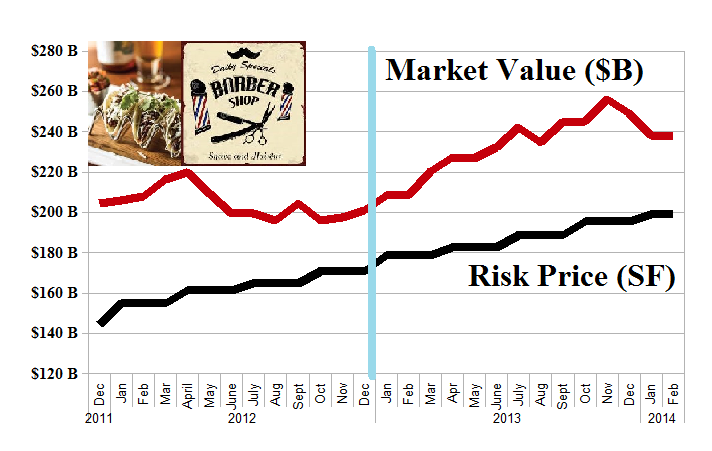 All seventeen of them but for Darden Restaurants (please see Exhibit 3 below) are in the Perpetual Bond™ now and that portfolio returned +54% last year, plus our share of the dividends. Please see Exhibit 2 below and click on the link “The Fastest Food In America – Portfolio & Cash Flow Summary” for more details. It’s because of our studied ignorance of how the market really works that we only buy and hold those stocks for which there is a demonstrated excess of demand over supply – that is, they are trading at or above the price of risk. 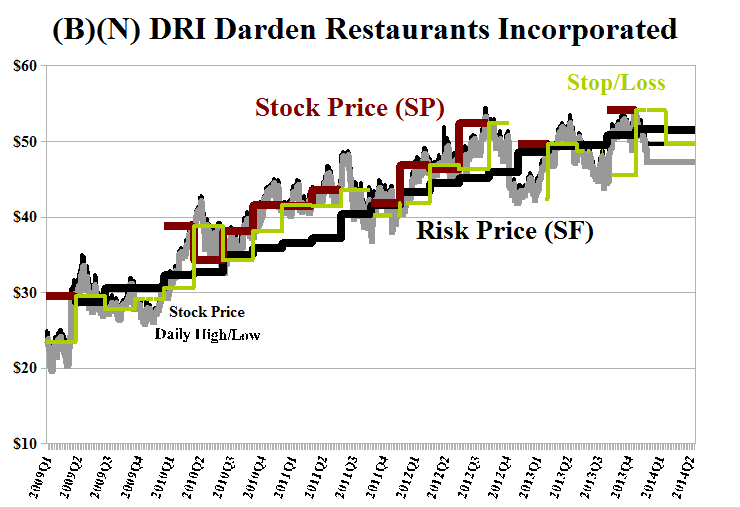 Darden Restaurants has been walking close to the line, that is, the price of risk which is calculated as the Risk Price (SF) (Black line), for several years and it was an easier buy and hold in 2010 through 2012 but has fallen through now. The indicated Stop/Loss prices are indicative only and need to be adjusted according to our sensitivity to a loss – and we always expect to lose but are often proven wrong.